I don’t normally talk about my commercial work over here on the blog, but i’m preparing for the launch of my new book next week, ‘Social Leadership: my 1st 100 days’, and pulling together a product brochure around everything ‘Social Leadership’. As part of that, i’ve sketched this up, a representation of everything i’m doing with Sea Salt Learning around Social Leadership. I’m sharing it here to give an illustration really of what you can achieve under a Scaffolded Social Learning approach within an organisation: how you can create a series of spaces, from the conversational, to the exploratory, to the developmental, to help people build capability in a new subject. The solutions here range from Executive Coaching, working with senior leaders to build awareness of the Social Age, and develop their own Social Authority, through to full Programme approaches, where you take people on a Scaffolded Journey, lasting many months, where they shape ‘the type of leader i will become’, through to multi day workshops, providing a foundations of knowledge, right through to ‘Masterclasses’, around specific skills, such as ‘storytelling’, or ‘building communities’. More recently, i’ve been focussed on developing capability at scale, with the release of MOOCs on ‘Foundations of the Social Age’, and a new MOOC to cover the 100 day Social Leadership voyage, and finally, the new book itself. 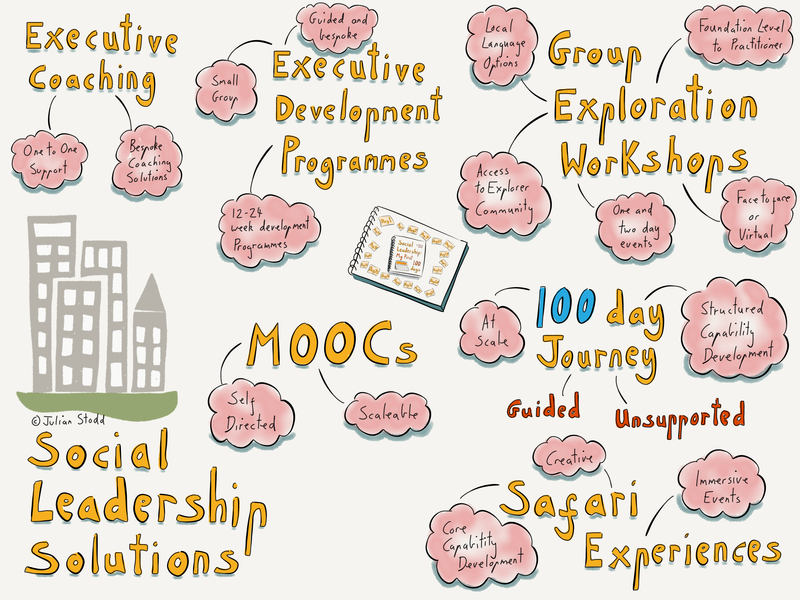 I’ll launch ‘Social Leadership: my 1st 100 days’ on 10th July, with a full MOOC, 100 podcasts, and a shared community of Explorers, #WorkingOutLoud as they progress through their own Social Leadership journey. I thought i’d share this, as i’m really rather proud about all this: it represents a few years work, by my rough count with 26 separate clients, across hundreds of blog posts and two full books on the subject. This entry was posted in Leadership, Social Learning and tagged Books, Capability, Leadership, MOOCs, Social Leadership, Teams. Bookmark the permalink.